Germany’s Federal Ministry of Education and Research, or BMBF, is to provide funding for a new Jewish studies centre in Berlin. Several institutions in the Berlin area are supporting the centre, which was launched last autumn. The BMBF will be supporting Berlin’s three largest institutions – Humboldt University, Free University and the Technical University – as well as the University of Potsdam, Abraham Geiger College and the Moses Mendelssohn Centre for European-Jewish Studies with a total of €6.9 million (US$9 million) over an initial period of five years to establish the Berlin-Brandenburg Centre for Jewish Studies. The centre is meant to link up and concentrate academic activities in the field of Jewish studies. Also, via visiting professorships and fellowships, it is to boost international exchange with scholars, in particular from the US, Israel, the UK, France and the Commonwealth of Independent States countries. In addition, research posts are to be created for junior scholars. The centre can count on a suitable environment for interdisciplinary activities. History and civilisation studies approaches are featured at Humboldt University, while Free University Berlin has a Jewish studies bachelor programme and also runs a masters in conjunction with Berlin’s Touro College, a Jewish-sponsored independent institution of higher and professional education. Bachelor and masters courses in Jewish studies at the University of Potsdam, just outside Berlin in Brandenburg, focus on religion, history and literature. Technical University Berlin has a Centre for Research on Antisemitism, which was founded in 1982 to examine not only antisemitism but also, at a more general level, xenophobia and racism. The Moses Mendelssohn Centre, meanwhile, conducts historical and philosophical surveys and research in literature, religion and the social sciences. Finally, Abraham Geiger College is a rabbinic seminary that was founded at the University of Potsdam in 1999. The centre is in line with recommendations on theology and religion-related disciplines issued by the Science Council, Germany’s chief advisory body on research policy. “What is particularly promising is cooperation between non-denominational scholars, for example from civilisation studies and social sciences, with denominationally bound colleagues at the Abraham Geiger College,” Schavan said. The Jüdisches Museum Berlin’s slanted designs suggest a world fractured by the Holocaust. There may be worse Jewish museums in the world than the Jüdisches Museum Berlin, which opened in 2001. But it is difficult to imagine that any could be as uninspiring and banal, particularly given its pedigree and promise. 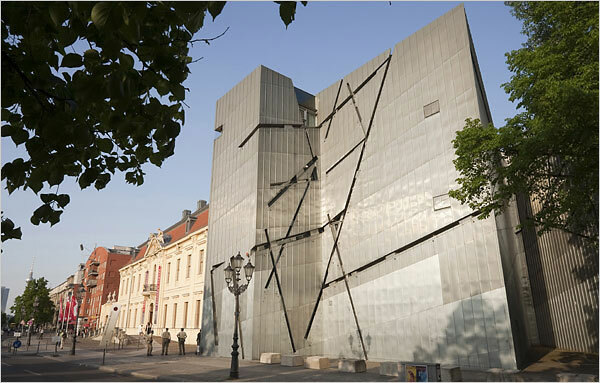 Has any other Jewish museum been more celebrated or its new building (designed by Daniel Libeskind) so widely hailed? Is any other Jewish museum of more symbolic importance?….